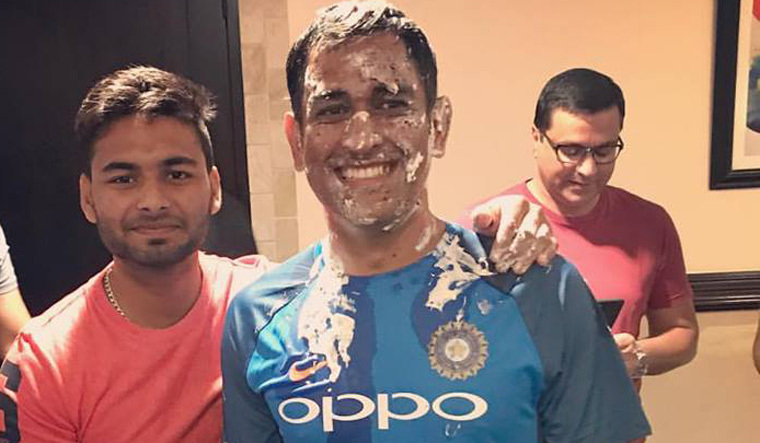 Touted as a potential successor to Mahendra Singh Dhoni behind the stumps, Rishabh Pant says the former India captain has helped shape quite a few things in his still nascent career, ranging from his IPL contract to hand-head coordination while keeping. "Whenever I needed any support from Mahi bhai, I used to ask him. From my IPL contract to my wicket-keeping, he's advised me on everything," 20-year-old Pant told 'bcci.tv'. "He's [Dhoni] always told me that when it comes to wicket-keeping, your hand and head coordination is important; the body balance can come into play later. That [his advice] has helped me a lot," said the southpaw. Pant says the positivity in the Indian team's dressing room is also quite infectious. Pant was not picked for the limited-overs leg of the England tour despite a stellar IPL show but earned his maiden call-up in Tests through his gritty performances with the A team. "Every time I come to the Indian dressing room, there is one thing that has always stood out for me. It is the positivity in the dressing room. Everyone is supporting and backing each other, which is the most important factor about this Indian dressing room," he said. "I reckon there isn't too much difference, but it has got more to do with shot selection. In red ball cricket, with the field placements, you can look around; take your time, because you have five days to play. Whereas in limited overs cricket, you have limited number of balls to play and score,” Pant observed. "I have so far enjoyed my preparation with red ball cricket. The duke ball swings a lot when you're here in England, and initially when I started playing here with India A, I realised that the swing will come a lot into play in these conditions." Pant also received praise from India A coach Rahul Dravid for his performance in England. "The only thing he [Dravid] tells me is that you need to be patient about everything, be it on the field or off it. Also, how I need to work harder on my game when it comes to red ball cricket since I'm a positive batsman, but at times you need to play to the situation. See the pace of the game and change your game accordingly,” Pant said. The fact that Pant has been playing in England for a while has prepared him well for the Test series. Dinesh Karthik is the first-choice keeper in the absence of Wriddhiman Saha, so it remains to be seen whether Pant will get his big break in the upcoming test series against England. Former India wicket-keeper Kiran More recently went to the extent of saying that Pant could be the next Adam Gilchrist. "I always see everything as an opportunity coming my way. Especially as a wicket-keeper batsman in India, wherein, there aren't too many options for the spot. Therefore, whatever opportunity I get, I try and optimise it,” Pant said. "Adam Gilchrist has been my idol when it comes to keeping wickets and I used to watch him all the time as a youngster. But, at this moment, I'm learning a lot from people around me like Rahul Dravid Sir, Ajinkya Rahane and Virat Kohli and I try and improve my game every day," he said. How did Pant react when he found out about his Test selection, especially after the disappointment of not making the one-day team? "He [Sinha] has always wanted me to play Test cricket for India and when I got the call, he was very happy and proud and I enjoyed that moment," Pant summed up.